Prevent unauthorised transactions in your account. Update your mobile numbers/email IDs with us. Receive information of your transactions directly from Stock Exchange on your mobile/email at the end of the day. * I have read Disclaimer - please click here to read Disclaimer. Muslim Religion Followers - please click here. CorpWill Presentation - please click here. Due to different Shariat Laws applicable to Muslim religion followers, our present application is not providing online Will writing facility for Muslims.However we provide a Customised Will writing offline facility for all Muslims as per applicable Shariat laws at additional cost. For offline Will writing, please contact at the below mentioned telephone number. CorpWILL is a product of CorpBank Securities Limited (â€œCBSLâ€) which is a wholly owned subsidiary of Corporation Bank. 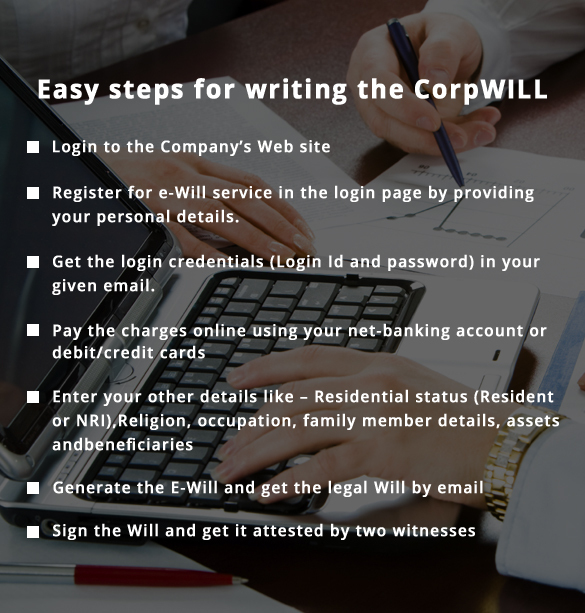 CorpWILL is backed by legal and technological expertise of Willjini.com. The log-in page of CorpWILL link will direct you to the website of WillJini Succession Services Private Limited (â€œWillJiniâ€) which will provide the facility of Will writing, successions planning services and other services available at the link. The WillJini Services are provided exclusively by WillJini. The provision of the link on the website of CBSL is for the convenience of our customers who are desirous of availing of the WillJini Services and is not and should not be construed as a recommendation, guarantee or other endorsement by CBSL in respect of WillJini and/or the WillJini Services and CBSL shall bear no obligation or liability in respect thereof. CBSL does not make any representation or gives any warranty with respect to CorpWILL powered by WillJini and/or the WillJini Services. Clients are advised to carry out their own due diligence and other checks in respect of WillJini before deciding to avail of the WillJini Services. No promise, representations, warranties, undertakings or conditions shall at any time be deemed to be implied herein or to arise between the client and CBSL and the existence of any such implication is hereby expressly negative. Any information about WillJini available on the website of CBSL is generated by WillJini and has not been verified by CBSL hence CBSL shall not be liable or responsible for any such information. If you choose to avail of the WillJini Services, your payment will be made directly to Willjini and the contract with respect to the same will be between you and WillJini alone and CBSL will neither be a party nor in any manner concerned with such contract. CBSL will, in terms of its independent agreement with WillJini, be entitled to receive a referral fee based on the terms and conditions agreed therein in case you decide to avail of the WillJini Services. CBSL shall be free to charge such referral fees or any other consideration from WillJini if you choose to avail of the WillJini Services and you have no objection in respect thereof. CBSL shall have no obligation whatsoever to share or pass on any portion of such fee with you or any other person. There is no direct or indirect linkage between the provision of the broking services offered by CBSL and the WillJini Services. CBSL is not responsible or liable for the performance by WillJini Succession Services Private Limited or otherwise for any act or omission of WillJini. If as a result of your acts or omissions, WillJini makes any complaint or raises any claim against CBSL, you shall be liable to indemnify CBSL in respect of the same. CONSENT FOR INFORMATION DISCLOSURE:Â By clicking on â€˜Submitâ€™ below you will be expressly permitting and directing CBSL to share any and all of your details in the possession of CBSL with Willjini.